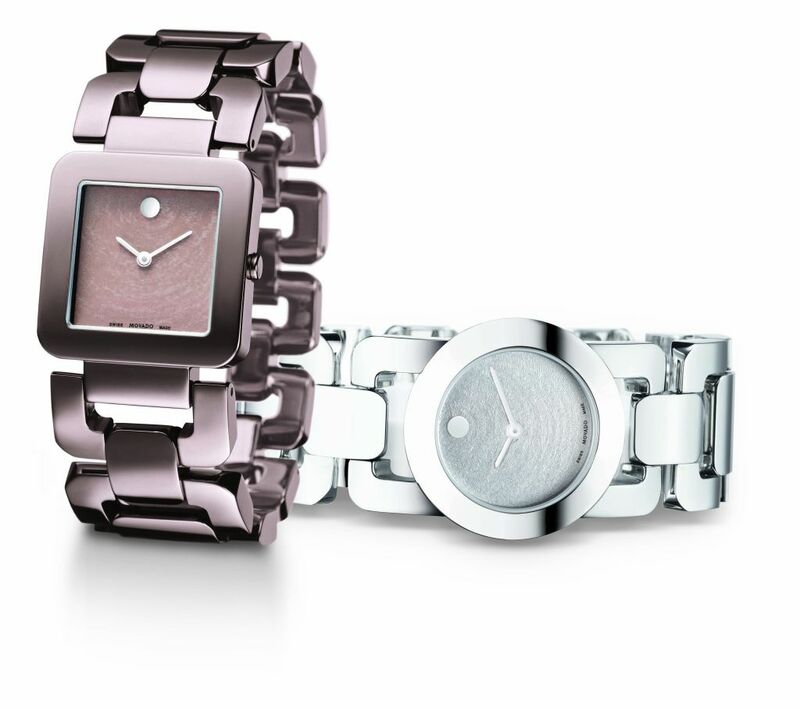 A fashion-forward jewelry watch for women, the arresting new Luma™ reflects Movado’s modern design aesthetic with chic audacity. Almost as wide as the case, its boldly styled bracelet is formed from a series of gently rounded, loosely joined handle-shaped links that fasten seamlessly with a jewelry clasp. The softly contoured case features an elegantly recessed crown to preserve the watch’s clean, contemporary lines. Dials textured to evoke the soft cosmetic appeal of powdered eye shadow add a uniquely feminine touch. This monochromatic “statement” timepiece is offered one-way in solid polished stainless steel with a round 31mm case and complimentary silver-toned powder-textured Museum® dial, an iconic design defined by a matching rhodium-plated flat dot at 12 o’clock and simple stick hands. Distinctively different, a second Luma style features a 28.5mm square case crafted in polished dark chocolate brown PVD-finished stainless steel. Its coordinating taupe-colored powder-textured metallic dial is minimally detailed by a flat rhodium-plated dot and elegantly thin silver-toned stick hands. Both of these new women’s Luma timepieces have fine Swiss quartz movements, scratch-resistant sapphire crystals and are water resistant to 3 ATM. MOVEMENT: Fine Swiss quartz movement. DIAL: Silver-toned Museum or square taupe colored metallic dial with unusual powder texturing, silver-toned stick hands and rhodium-plated flat dot at 12 o’clock. CASE: Round 31mm solid stainless steel or square 28.5mm dark brown PVD-finished stainless steel case with sapphire crystal. Water resistant to 3 ATM. BRACELET: Solid or dark brown PVD-finished stainless steel stylized link bracelet with jewelry clasp.